Fiamma Pizza Co.'s specialty pizza No. 7 is a 14-inch pie topped with a very light tomato sauce, pepperoni, sausage, Prosciutto di Parma, pancetta, ricotta, romano, fresh basil and olive oil. 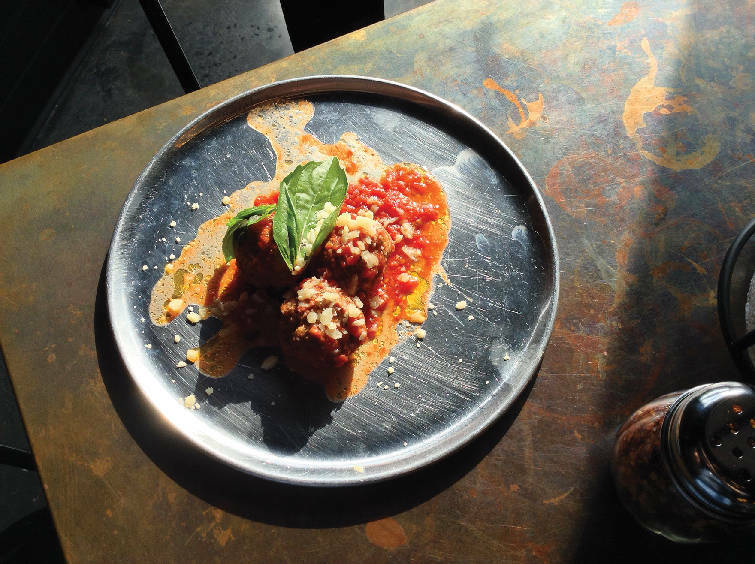 Fiamma Pizza Company's meatball appetizer features three meatballs in a light marinara, topped with crumbly romano and fresh basil. › Where: Fiamma Pizza Co., 405 N. Market St.
› Hours: 11 a.m.-10 p.m. Monday-Saturday. Is there a more perfect food than pizza? Basic toppings or complex ingredients. Tomato sauce — white or pesto. Thin crust or deep dish. Hot or even cold the next day. However it's made and served, pizza is comfort food that pairs well with anything, including both beer and wine. And you can take it anywhere — no utensils required (usually). Although I like nearly all variations, my preference leans toward thin crust and not too much sauce. From there, I'm not that picky. Having tried Chattanooga's best pizzerias, I wondered how the city's latest entrant, Fiamma Pizza Co., would measure up. Nestled amid the shops and boutiques along ever-growing North Market Street on the city's North Shore, Fiamma specializes in wood-fired Neapolitan pizza, which typically is heavier on sauce, lighter on cheese and baked at a very high temperature. To accomplish this, Fiamma uses an oven imported from Italy, where Neapolitan pizza-making originated (in Naples) some 300 years ago. Fiamma's pizza maker apparently studied with one of the nation's foremost experts on this style of high-heat, fast baking, and the results are impressive. Fiamma's menu features 10 specialty pizzas and an array of sandwiches and salads, or you can build your own pizza starting at $9.99, with toppings an additional $2 to $3 each. The restaurant also boasts an impressive list of at least 50 domestic, craft and imported beers. After weighing all the options, I went with specialty pizza No. 7 — a 14-inch pie topped with a very light tomato sauce, pepperoni, sausage, Prosciutto di Parma, pancetta, ricotta, romano, fresh basil and olive oil ($18.99) — and the meatball appetizer ($4.99). The restaurant's motto is "It's all about the dough," and they're not lying. The thin, wood-fired crust was light and airy — the perfect foundation to create this artful masterpiece of savory meats and cheeses. The fresh basil and a bit of olive oil were perfect complements. This is, without a doubt, one of the best pizzas I've ever tasted locally or beyond. The meatball appetizer was portioned for one person. The dish consisted of three decent-size meatballs served in a light marinara and topped with crumbly romano and fresh basil. It had a nice, moist consistency and was full of flavor, so next time I might try the meatball sandwich ($9.99), which is dressed with tomato sauce, ricotta and provolone. Clean and spacious, Fiamma has an uncluttered décor with ample dining room upstairs and a lower dining area that includes a bar and patio. Polished concrete floors, burnished copper tabletops and shiny, black metal chairs complete the space. Several families with young children were dining on this visit, and the noise level was a bit raucous, so this might not be the best place for a quiet dinner. My server, Hannah-Paige, was helpful from the start, coming over to explain the finer points of Neapolitan pizza-making as I studied the array of options on the large chalkboard menu. I got the appetizer in about 12 minutes. The wait was longer than expected for the pizza even though it was relatively early in the evening (a complaint I also overheard from those at the table behind me), but it eventually arrived hot and delicious, with apologies for the delay. Chattanooga was recently named the eighth best city in America for pizza lovers, according to personal finance technology company Smart Asset. 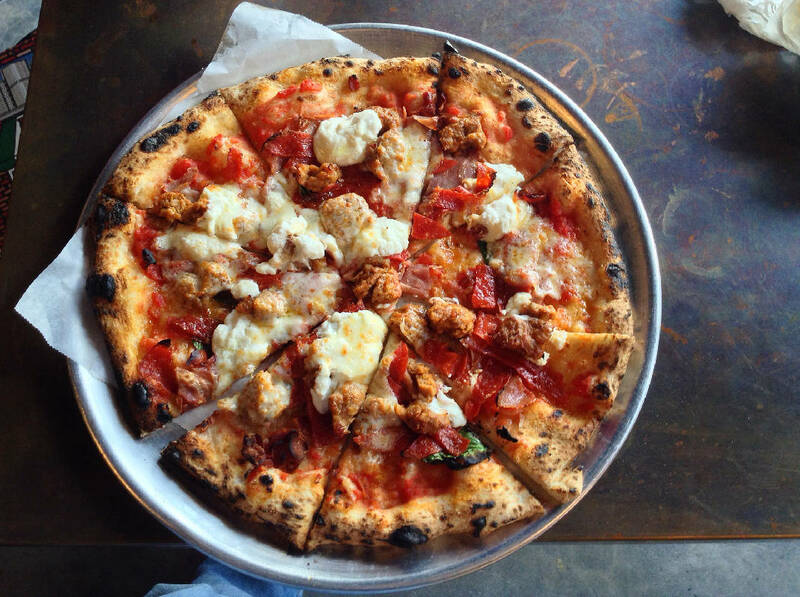 Fiamma's marvelously good pies should go a long way toward not just cementing the Scenic City's place in that ranking but also moving it up a couple notches. I'll definitely be back. Contact Chris Zelk at czelk@timesfreepress.com or 423-757-6244.